Have you tried Dunkin’ Donuts Turbo coffee yet? If not, now’s the perfect time to try it. 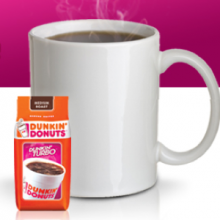 Here’s a printable coupon for $1.50 off one Dunkin’ Turbo packaged coffee. Hold onto this coupon, Dunkin’ coffee goes on sale frequently at Target! May 6th kicks off Nurses Appreciation Week at Dunkin Donuts. Dunkin Donuts will be offering a free small 16 oz Dunkin Dark Roast iced coffee between 4 p.m. and 10 p.m. This offer is good through May 12th. You will need ID at the time of purchase. Every Monday in March, you can grab a free Dunkin’ Donuts medium-sized hot or iced coffee. For those of us who are too far away from a Dunkin’ Donuts, get a free sample of their new Dunkin’ Turbo. If you would like Dunkin’ Turbo delivered to your door, sign up now!